Real estate rates have been improving steadily since 2013. Although the increase has been slow, property values increased by 3% over 2014 as well. With 2015 upon us, investors and first-time home buyers are carefully watching the market. However, the industry experts like Jeff Adams predict that 2015 could turn out to be an excellent year for real estate for buyers and investors for several reasons. Traditionally, most of America’s small cities were nine-to-five or cities that were heavily populated during office hours. Office workers usually commuted from these small cities to large industrial hubs to do their jobs and then traveled back home. This is no longer acceptable and city authorities are now actively expanding small satellite communities by adding housing, retail opportunities, and dining. This has also led to a migration of offices into smaller US cities. The direct result of this migration has been the opening up of several new real estate markets that are quite affordable for the small real estate investor. Rental rates are increasing. In fact, US renters paid 5% more in rental rates in 2014 and the rates are expected to increase even more. For example, prominent cities like San Francisco saw a 14% increase in rent in the last year. As rent increases, the Millennial generation will prefer to buy a home rather than invest. This will increase demand and the construction industry is already stepping in with new homes to meet the demand and level out the prices. The industry that was worst hit by the real estate collapse was the construction industry. Due to the fluctuating market rates, construction literally stopped completely. However, rental rates are increasing and this is making it difficult on finances. As job security increases and mortgage rates remain low, Millenials are now thinking about investing in real estate and turning into first-time home buyers. This could result in new constructions, more inventory, and a leveled-out property rate that is good for investment and first-time buyers too. Foreign investors have been picking up American real estate in large amounts. As inventory decreases, investors are getting picky. They are more likely to pick high-end properties, renovate them, and rent them out. However, this type of foreign investment is expected to decrease substantial as home countries implement taxes to prevent this. For example, the UK might implement a mansion tax that will be applicable on people who own properties more than 2 million British pounds inside Britain or outside. Similarly, China has also placed restrictions on Chinese investment in the US. These factors clearly show that the US real estate market is still interesting for a lot of buyers. With mortgage rates becoming affordable, rental rates increasing, and the real estate marketing opening up; the choices are endless. 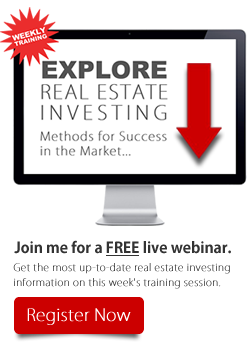 If you are interested in real estate investing, industry professional Jeff Adams #1 Real Estate Trainer recommends you attend a training class to help you learn as much as possible real estate investing. With the right training and help, you could easily double your investment. Keep a look out for our next free bi-weekly online training.